Phamie Gow, one of Scotland's most gifted and versatile composers/performers has played in venues around the world, including New York's Carnegie Hall, with Ray Davies, Philip Glass, Marisa Monte, Band of Horses, Patti Smith's backing band and others. 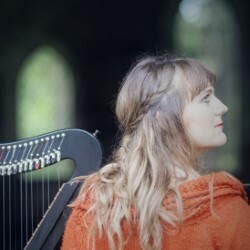 This special one night only performance will feature Phamie on piano, harp and vocals with a remarkable Classical Celtic and African/Jazz twist. She will be joined on stage by Scotland’s Fraser Fifield, cellist Su-a-Lee and friends from Africa and France on bass, drums and electric guitar. More special guests will be announced on the night.